We had tolerable weather and a great turnout at our third-annual Score-O at CU-Boulder. In addition to "the regulars", we had a group from the Civil Air Patrol, several groups of beginners, and a few people who had attended our recent Orienteering Workshop at REI-Boulder. While completing the course through the campus, runners got to enjoy a live band, a car show, a football game, and a soccer game. Holding our meet while school is still in session gave it a little bit of a different atmosphere. THANK YOU to Troy Bozarth for helping with Start / Finish Timing and Beginner Instruction throughout the day. I should also thank Jason Poole for his indirect Course Setting assistance, since I recycled some of his control locations and clues from 2006 and 2007. OCAD experts J-J Coté and Christoph Zurcher gave me good pointers for the map updates. Note: Eight of the 37 people who visited control #3 wrote down the wrong answer, by looking at the wrong set of doors and numbers. 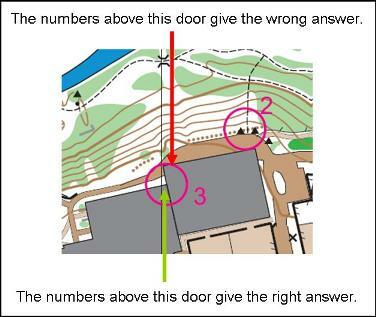 If you look carefully at the map, the control circle for #3 is centered on the door near the inside corner of the building (see map snippet enclosed below). I thought about awarding points for the wrong answer on that one, since those eight people were in generally the right area. But, on a "real" orienteering course, you would never be given credit for punching the wrong control, even if it was close to the correct control; precision and accuracy are both required to successfully complete an orienteering course. Thanks again for attending! I hope everyone had fun. There are some photos linked below (although the dirt parking lot we used as our Start / Finish area wasn't especially scenic for photos...).